Electron microscopy affords the highest possible resolution of subcellular structures in the cytoplasm of muscle cells. We have used it extensively to examine the fine structure of muscle. Most of our studies have utilized standard procedures for preparing thin sections (~90 nm thick) of muscle that was fixed and labeled with electron dense stains to visualize the contractile apparatus, organelles and membranes. An example of one such experiment (see below) reveals the increase in the number of mitochondria under the plasma membrane mice missing keratin 19, compared to wild type. Some of our studies have used “quick freeze, deep etch, rotary replication” electron microscopy to visualize filaments and coated pits associated with the plasma membrane of muscle cells in culture. In this method, cells are snap frozen instantaneously at very cold temperatures, to ensure that large ice crystals that could distort ultrastructure do not form. The samples are then cracked open with a knife and the ice on the surface is removed by sublimation under high vacuum. Finally, the surfaces exposed by the earlier steps are coated with a metallic film, which is then removed and observed under the electron beam. Coupled with antibodies linked to colloidal gold particles, which are visible in the microscope as small dots, this method can be used to localize proteins on the cytoplasmic surface of the plasma membrane of muscle. An example is shown below. The gray and white structures show the etched surface covered with a platinum film. 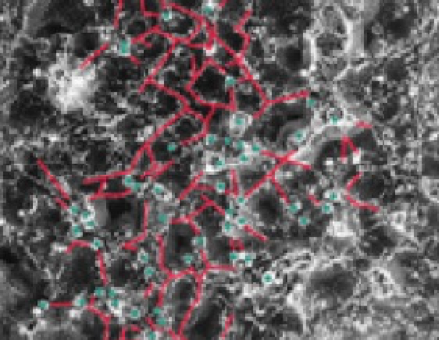 This reveals fine filaments on the inner surface of the muscle cell membrane (highlighted in red). The dots (highlighted in blue) are gold-labeled antibodies to ACF7.